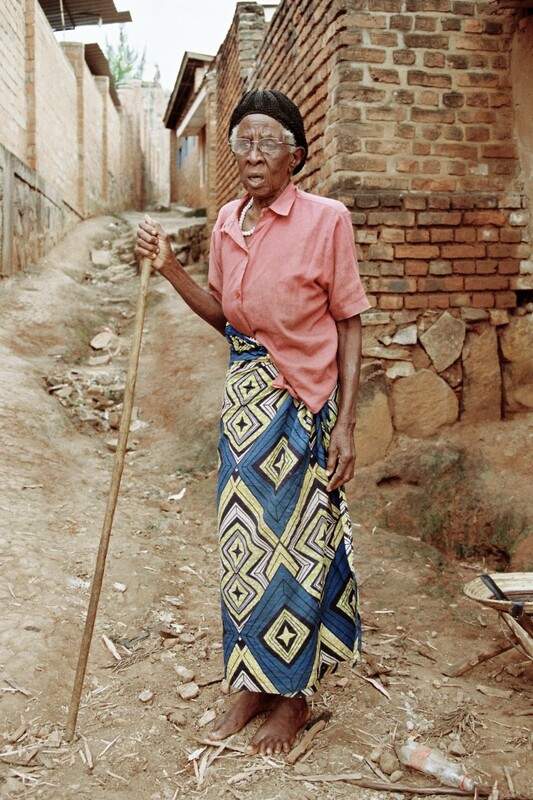 In April 1994 between 800,000 and a million men, women and children were murdered in Rwanda. Six years old at the time, I too young to comprehend world news, unaware of the wave of violence sweeping through a country only a short flight from my home in South Africa. Twenty-one years later I arrive in Kigali by myself. I have a travel backpack, two analog cameras, an empty notebook and no idea what to expect. First came the offer to travel to Rwanda to work on a commercial and spend two weeks exploring the country. The next step was getting onto the first available flight. I haven’t had time to think beyond that. I’m just another tourist with a camera. Kigali food market. Business at its finest in Rwanda. 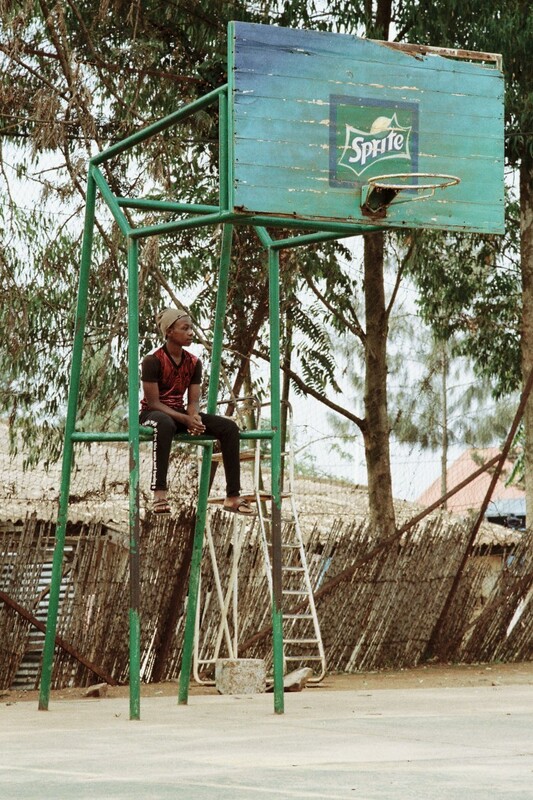 Reflecting at the sports and recreation centre in Nyabugogo. Kigali City surprises me from the moment I arrive. The streets are pristine, the green rolling hills and endless valleys are picture perfect as I whizz downtown on the back of a moto-taxi. Roadside plastic gorillas are my welcoming party as we dart through the traffic – them and the signs urging ‘Kwibuka’ the Kinyarwanda word for ‘remember’. I am staying in a complete stranger’s house but he welcomes me with open arms, as do most people – a good sign of things to come, I hope. I decide to dive into Kigali. Nothing feels off limits. I walk around Kacyiru, a residential area to the north of Kigali, and people stare. I understand how painfully out of place I am. I sit with kids playing in the dirt. One of them asks for my pen and I have to break up the fight that breaks out over it. I visit a small arts centre for children and play with them. 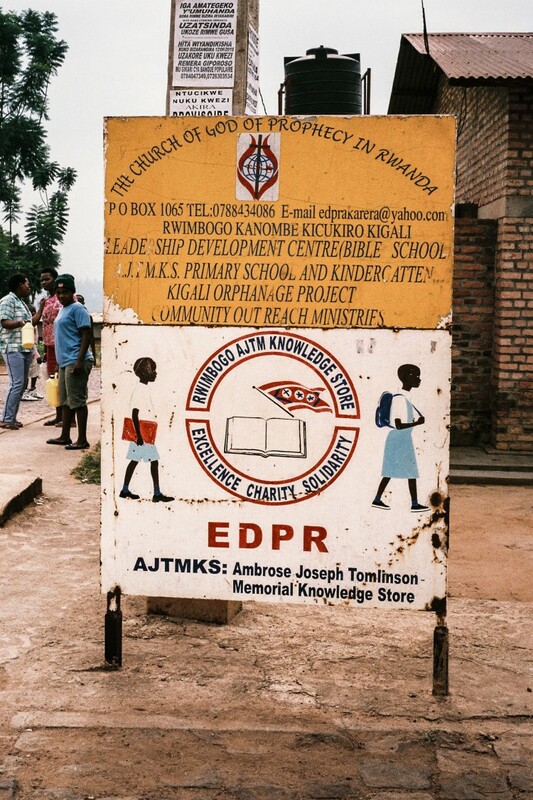 Children represent a large percentage of the Rwandan population and while more than 60 per cent of the population lives in poverty; Rwanda has the highest primary school enrolment rates in Africa for both boys and girls. 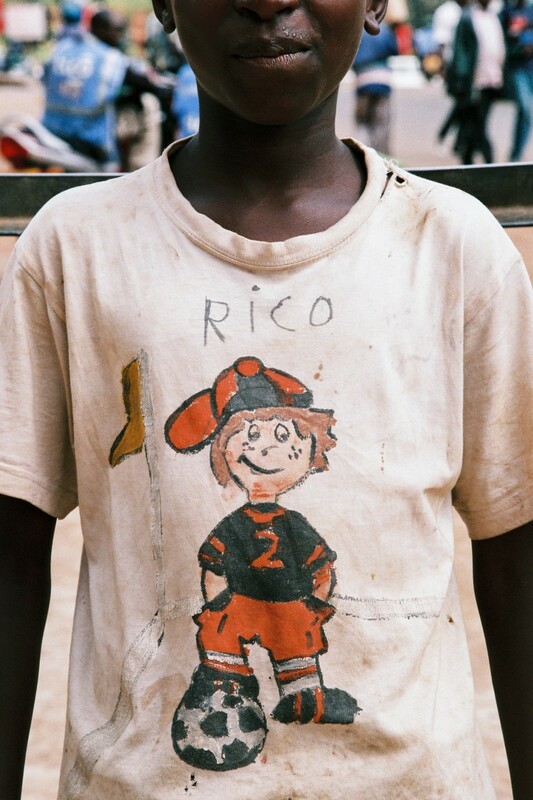 Street kid in Nyamirambo, one of Kigali's most manic areas. Downtown Kigali is a busy place. People pack trucks with goods piled into the sky. People barter on every block. Reaching Nyabugogo market is a photographer’s dream. The transport hub for the whole of East Africa is a chaotic symphony of floods of people and buses in all directions, the bustling business of a major transport route. I meet a fixer and some people who are keen to laugh and talk to us. My new friend doesn’t speak a word of English but we spend the next six hours together and he understands me enough to help me meet and capture portraits of people I come in contact with. Our bond feels like something solid, calm, in the bedlam and I’m sad when our day comes to an end and we part ways. 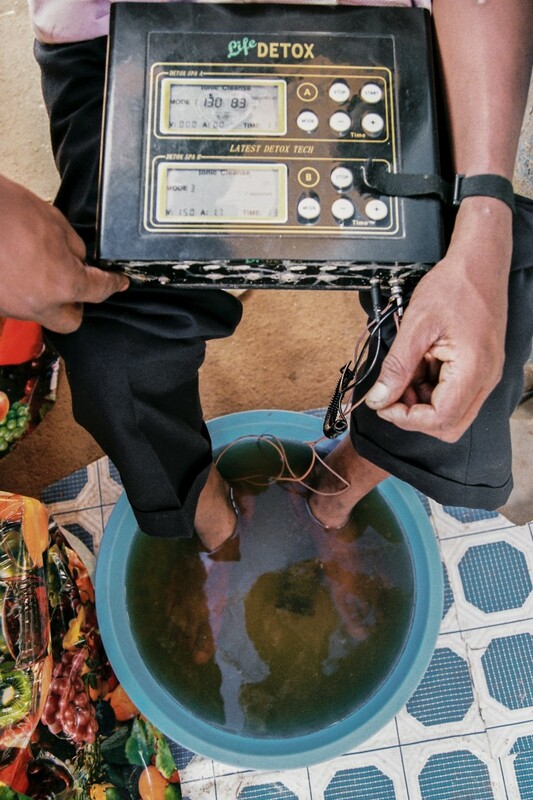 At a local market I meet men practising unorthodox medical diagnoses with laptops, treadmills and buckets of water. I get roped into a nice man’s business to test out his medial assessments free of charge. I agree. Within minutes a crowd has gathered to watch the white man – the ‘Umzungu’ – get his medical tests done. He tells me my liver and my head are damaged and suggests moving onto traditional healing next. I thank him for his time but decline. By now the queue of people lining up for his business has quadrupled. I feel happy to have helped and we exchange details; I shoot some photos and call it a day. Unorthodox medicinal practices are frequent in Nyamirambo. 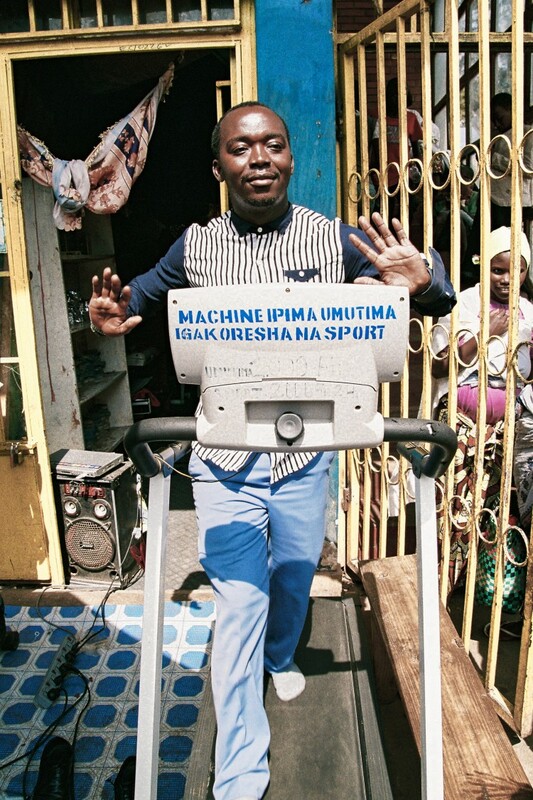 One of the store owners of a roadside healing practice shows off his treadmill. I wander into any area without fear. Safety is Rwanda is paramount – beyond that of any other country I’ve visited. People keep asking me if I’m lost but I feel like I’m on the right track. I visit Camp Kigali, a memorial to the 10 Belgian UN peacekeepers who were killed here in on April 7, 1994. Bullet holes texture every surface and the floor is riddled with grenade craters. I sit on the floor and try to reflect on what happened in this space. Echoing life back at home in South Africa, it’s a strong reminder of how much can change in two decades. 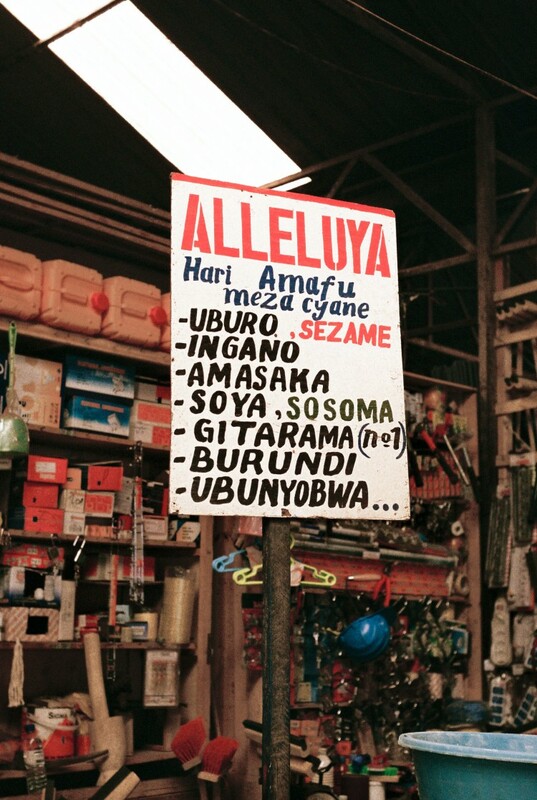 If Camp Kigali is a quiet memorial to the past, the densely packed markets plunge me straight back into the present tense. They’re lined with every fruit and vegetable imaginable; the clothing goes on forever. Nine out of 10 people in Rwanda are subsistence farmers – this is business at its finest in the third world. A drive towards the border and Lake Kivu allows me some insight into rural life here. I photograph an elderly woman hard at work – women are the backbones of their villages and the country as a whole – her lined face in stark contrast to those of the many children also at work in the endless fields. The countryside inspires me to take some of my favourite photos of the trip; disparity is everywhere, in those faces in the fields and in the ever-present natural beauty and profound poverty coexisting in every frame. 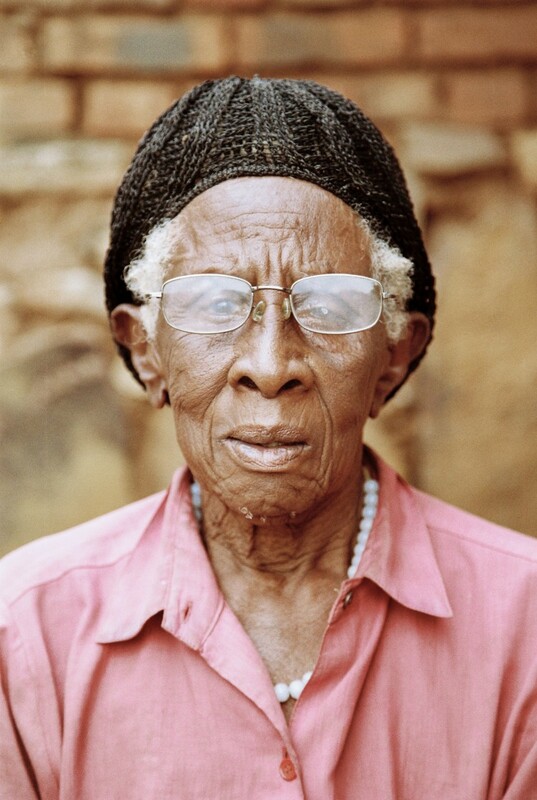 A wonderful elderly lady I stumbled across in the slums. Her captivating face made it impossible to take her picture. Nyamirambo, in south-west Kigali, is unlike anywhere else in Rwanda. It’s a culturally rich area where art, religion and diversity merge seamlessly. I befriend some local hip-hop heads and they take me to ‘California City’, one of the darker and more interesting hoods of Nyamirambo. Cruising the frenetic secondhand clothing markets, people haggling for the best deals in every direction, I’m so painfully out of place that it’s wonderful. This creates some special photo opportunities, after which we grab brochettes (goat on a skewer) for lunch and I spend the rest of my time in Nyamirambo befriending locals and sharing stories. 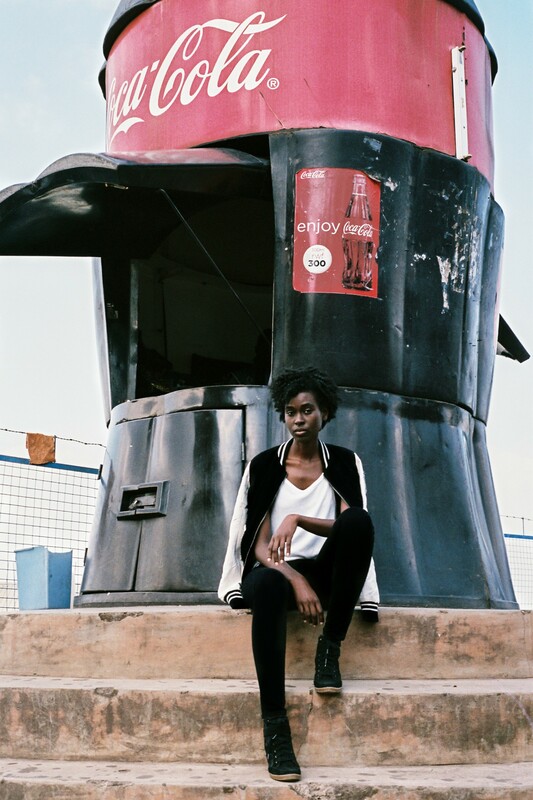 Exploring an abandoned zoo in downtown Kigali with model Sabrina Bookalisi. Enjoying a Coca-Cola with Rachel Neza in downtown Kigali. One of my final days in Rwanda is spent shooting a music video for a local rapper. We end up shooting in an abandoned zoo on the top of a mountain and I feel like I’m truly in a location that has never been photographed like this before. A large group of rappers and kids come to hang out with us and join in on the fun; still, the laughter and jokes don’t mask how hard life is for young adults in Rwanda. Tenacity. It’s a theme that follows me to the end of the trip. Rwanda gives me hope that countries dealing with instability and turmoil can go on to heal and produce a positive future for all their citizens. I know what I have seen and photographed and I hope that I am telling that story.